Thursday, March 1, 2007 Jonathan Gruber sent us a Biography for Tokagero. Thanks Jonathan! Friday, November 04, 2005 Well, we are officially going to axe the Shaman King COTD site for a while. UDE doesn't appear to be making any more cards. I was told that the game & anime are doing well in Europe, but I guess they're not doing well here in the U.S. andysislands has been doing Card of the Day for a long, long time, and checks in with the last one. It's a good one for today: Day of Atonement. Thanks for everything there Mr. AndysIslands!!! Check out our last Card of the Day. (unless something good happens). There hasn't been much activity in our Shaman King world, but we have do have an Episode Guide from BeBe, our 13 year old Shaman king girl. She helps us out with The Way of Rice episode #52. 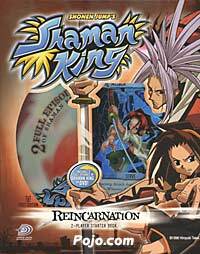 Wednesday, September 07, 2005 Today's Shaman King Card of the Day is Reverberate. andysislands has a review. Friday, September 02, 2005 Today's Shaman King Card of the Day is Ice Storm. andysislands has a review. Wednesday, August 31, 2005 Today's Shaman King Card of the Day is Owned!. andysislands has a review. Tuesday, August 30, 2005 Today's Shaman King Card of the Day is Joco; Jocular Comedian. andysislands has a review. Friday, August 26, 2005 Haven sends us a TCG Tip. He presents his ideas on Stacking the Deck. Today's Shaman King Card of the Day is Anna; Future Shaman Queen. andysislands has a review. Wednesday, August 24, 2005 Today's Shaman King Card of the Day is Purity of Mind. andysislands has a review. Monday, August 22, 2005 Today's Shaman King Card of the Day is 1080 Flash. andysislands has a review. Friday, August 19, 2005 Today's Shaman King Card of the Day is Mikihasa; Masked Mentor. andysislands has a review. Thursday, August 18, 2005 Today's Shaman King Card of the Day is Shattering Palm. andysislands has a review. Monday, August 15, 2005 Today's Shaman King Card of the Day is Ancient Discipline. andysislands has a review. Friday, August 12, 2005 Today's Shaman King Card of the Day is Talisman Warrior. andysislands has a review. Wednesday, August 10, 2005 Today's Shaman King Card of the Day is Disheartening Blow. andysislands has a review. Monday, August 08, 2005 Today's Shaman King Card of the Day is Devoted Sentry. andysislands has a review. Friday, August 05, 2005 Today's Shaman King Card of the Day is Triple Threat. andysislands has a review. Today's Shaman King Card of the Day is REI-133 Consuming Hatred. andysislands has a review. Monday, August 01, 2005 Today's Shaman King Card of the Day is Furious Response. andysislands has a review. Friday, July 29, 2005 Today's Shaman King TGIF Card of the Day is another Venster. This time it's Venster; Tactician. andysislands has a review. Wednesday, July 27, 2005 Today's Shaman King TGIF Card of the Day is Venster: Punisher. andysislands has a mid-week review. Friday, July 22, 2005 Today's Shaman King TGIF Card of the Day is Groundswell. andysislands closes out the week. Wednesday, July 20, 2005 Today's Shaman King Card of the Day is Ancestral Apparitions. andysislands has a review. Tube-Topped Terror. Yes. Not a typo. Tube-topped terror. Kinda funny. Blank Zero and andysislands close out the week with a look at this card. Wednesday, July 13, 2005 Today's Shaman King Card of the Day is Matti, Witch in Pigtails. Blank Zero and andysislands have a hump day review for you. Monday, July 11, 2005 Today's Shaman King Card of the Day is Mari, Doll Mistress. andysislands and Blank Zero start us off with reviews this week. Friday, July 08, 2005 Today's Shaman King Card of the Day is Manifestation of Power. andysislands and Blank Zero have reviews. Wednesday, July 07, 2005 Today's Shaman King Card of the Day is Snowdrift. andysislands and Blank Zero have reviews. Don't forget our Episode Guide for the Shaman King Anime. BeBe -- 13 year old Shaman king girl sends in a summary for her favorite episode, Hearts of Darkness. Tuesday, July 05, 2005 andysislands has updated the Shaman King Frequently Asked Questions Page. Nice work Andy. andyislands has also made the Errata easy for you to find. Right here. Today's Shaman King Card of the Day is Rain of Bones, and andysislands has a review for that too. It's been a busy day for him. Friday, July 01, 2005 Today's Shaman King Card of the Day is Hunter's Perch. andysislands has a review. Fans are helping us build a Bios section for Shaman. Julieanne Fowler gives us a hand today. Wednesday, May 29, 2005 Today's Shaman King Card of the Day is Comeuppance. Blank Zero and andysisland have reviews. Monday, May 27, 2005 Today's Shaman King Card of the Day is Duncan: Crusader. Blank Zero and andysisland have reviews. Friday, May 24, 2005 Today's Shaman King Card of the Day is Mob Mentality. Blank Zero closes out the week with a review. Wednesday, May 22, 2005 Today's Shaman King Card of the Day is Titanic Summons. Blank Zero and andysisland have reviews for you. Monday, May 20, 2005 Today's Shaman King Card of the Day is Burning Hunger. Blank Zero and andysisland have reviews for you. Friday, June 17, 2005 Today's Shaman King Card of the Day is Blinding Foray. andysisland and Blank Zero have their T.G.I.F. reviews. Wednesday, June 15, 2005 Today's Shaman King Card of the Day is No Quarter. andysisland and Blank Zero have reviews for you. Tuesday, June 14, 2005 Blank Zero sent us a spoiler for the Chamber Cards in Reincarnation to go along with stachura's spoiler from yesterday. It's also in the left margin for future reference. Monday, June 13, 2005 stachura sent us a "Deck Builder Friendly Spoiler", which is pretty cool. It's in the left margin for future reference. Today's Shaman King Card of the Day is Assailing Aegis. Blank Zero and andysisland kick it off this week. Friday, June 10, 2005 Today's Shaman King Card of the Day is Bestial Savvy. Blank Zero and andysisland close out the week with reviews. Wednesday, June 08, 2005 Today's Shaman King Card of the Day is Thug Life. Blank Zero and andysisland have a reviews. Tuesday, June 07, 2005 Today's Shaman King Card of the Day is Feral Instinct. andysisland has a review. Thursday, June 04, 2005 Today's Shaman King Card of the Day is Outnumbered. andysisland has a review. Wednesday, June 01, 2005 Today's Shaman King Card of the Day is Tag Team. andysisland has a review. Monday, May 30, 2005 Today's Shaman King Card of the Day is United Front. andysisland has a review. Friday, May 27, 2005 Today's Shaman King Card of the Day is Amidamaru, Legendary Samurai. Blank Zero has a review. Wednesday, May 25, 2005 Today's Shaman King Card of the Day is Broom Corn Beatdown. Blank Zero and andysisland have reviews. andysisland can't sit on his hands while someone else posts a Shaman King Top Ten so he submitted one of his own. Check out his Top 10 new shamans list. Monday, May 23, 2005 Today's Shaman King Card of the Day is Invulnerability of the Leaf. Dan the Timid, Blank Zero and andysisland have reviews. Friday, May 20, 2005 We have our very first Shaman King Top Ten submitted from Blank Zero one of our newest Shaman King Card of the Day reviewers. Way to get the ball rolling Blank! Today's Shaman King Card of the Day is Shikigami. Dan the Timid, Blank Zero and andysisland have reviews. Wednesday, May 18, 2005 Today's Shaman King Card of the Day is Big Bill. Dan the Timid, Blank Zero and andysisland have reviews. Tuesday, May 17, 2005 Today's Shaman King Card of the Day is Unerring Garrote. Dan the Timid, Darth, andysisland and BlankZero all have reviews. Friday, May 13, 2005 Today's Shaman King Card of the Day is Gush of Flame. Dan the Timid, andysisland and BlankZero all have detailed reviews. Thursday, May 12, 2005 Today's Shaman King Card of the Day is Rail Bird. Dan the Timid and andysisland have reviews. And, we welcome a new reviewer, BlankZero. Tuesday, May 10, 2005 Today's Card of the Day is "Hijinks". Dan, Darth, Andrew & Andysisland all love this card! For those of you that read the manga (guilty over here), Viz has recently released Volume 6 of Shaman King in English. This manga concludes the cliffhanger of the Shaman Fight between Yoh & Faust VIII. Amazon.com doesn't have it yet, but other stores do. Friday, May 06, 2005 Today's Shaman King Card of the Day is Viaticum. Dan the Timid, Darth, DagoraBlade and andysisland have reviews. Wednesday, May 04, 2005 Today's Shaman King Card of the Day is Jeanne, Iron Maiden. Dan the Timid and andysisland have reviews. And, we welcome a new reviewer, DagoraBlade. Iron Dragon Thrae sends us a TCG Tip. In it, he answers the burning question of How to Establish the Foundations of this Game? Monday, May 02, 2005 Today's Shaman King Card of the Day is Conviction. Dan the Timid, Darth and andysisland have reviews. Friday, April 29, 2005 Today's Shaman King Card of the Day is Euthanize. Dan the Timid, Darth and andysisland have reviews. Wednesday, April 27, 2005 Today's Shaman King Card of the Day is Surgeon's Implements. Dan the Timid and andysisland have reviews. Justin Ngai sends us a little something for our TCG Tips Section. Check out his 3 equal counterattack opportunities?, and send in a few of your own. Monday, April 25, 2005 Today's Shaman King Card of the Day is Ward Off. Dan the Timid, andysisland and Darth Vailo have reviews. Today's Shaman King Card of the Day is Rouge Shot. andysislands, Darth and Dan the Timid have reviews. Wednesday, April 20, 2005 Today's Shaman King Card of the Day is Reposition. andysislands and Dan the Timid have reviews. Tuesday, April 19, 2005 Zach Lowman sends us A Handful of Shaman King Tips for our TCG Tips Section. Check 'em out and get up to speed on this new game as it becomes more popular. Monday, April 18, 2005 Today's Shaman King Card of the Day is Pleasant Distraction. Darth Vailo, andysislands and Dan the Timid have reviews. Friday, April 15, 2005 Today's Shaman King Card of the Day is Dark Ascendance. Darth Vailo, andysislands and Dan the Timid have reviews. Wednesday, April 13, 2005 Today's Shaman King Card of the Day is Director's Cut. andysislands, Darth Vailo and Dan the Timid have reviews. Monday, April 11, 2005 Today's Shaman King Card of the Day is Epicenter. andysislands, Darth and Dan the Timid have reviews. Friday, April 08, 2005 Today's Shaman King Card of the Day is Faust VIII, Boneyard Sorcerer. andysislands and Dan the Timid have reviews. Wednesday, April 06, 2005 Today's Shaman King Card of the Day is Silva, Impartial Judge. andysislands, Darth and Dan the Timid have reviews. Monday, April 04, 2005 andysislands has put together very cool FAQ's page (Frequently Asked Questions Page) on the Shaman King Card TCG. It's right here, and in the left margin for future reference. Nice work Andy! BridgitKiido sent us a couple of Episode Summaries for our Shaman King Anime Episode Guide. If anyone else wants write some, feel free to send them over. Thanks! vegeta000110 sent us a TCG Tip on Using Your Spectergrams Effectively. It's in our TCG Tips Section today. Jeazard sent us some Bios for the Anime section today. Today's Shaman King Card of the Day is Lililala, Keeper of Memories. andysislands, Darth and Dan the Timid have reviews. Friday, April 01, 2005 Today's Shaman King Card of the Day is Tandem Tomfoolery. andysislands, Darth and Dan the Timid have reviews. Wednesday, March 30, 2005 Today's Shaman King Card of the Day is Conchi Kick. andysislands and Dan the Timid have reviews. Tuesday, March 29, 2005 DefenseIncorporated delivers us an article on his Counterbalance Strategy for our Shaman King Tips section. Today's Shaman King Card of the Day is Ponchi Punch. andysislands, Dan the Timid and Darth Vailo have reviews. Friday, March 25, 2005 Today's Shaman King Card of the Day is Baby Steps. andysislands, Darth Vailo and Dan the Timid have reviews. Thursday, March 24, 2005 Austin Cooper sends us The WackyNess Of Matti Deck for our Shaman King Tips section. Wednesday, March 23, 2005 Today's Shaman King Card of the Day is Eon Crush. andysislands, Darth Vailo and Dan the Timid have reviews. Monday, March 21, 2005 Siren sent us a huge article on how to build a Lyserg deck. It's in our Shaman King Tips section today. Today's Shaman King Card of the Day is Smoldering Confidence. Darth Vailo, andysislands and Dan the Timid have reviews. Friday, March 18, 2005 Today's Shaman King Card of the Day is Lee Pai-Long, Daodando Master. andysislands and Dan the Timid have reviews. East Wind Dragon Thrae sends us his take on Basic Deck Structures for our Shaman King Tips section. Wednesday, March 16, 2005 Today's Shaman King Card of the Day is Jun, Big Sister. Andysislands and Dan the Timid have reviews. Monday, March 14, 2005 Knives has something very cool for you today. Knives managed to get an interview with one of the lead game designers for the Shaman King TCG - Brian Hacker. Have fun reading it everyone. AnimeFan Colin sent us a review of the Shaman King: Legacy of the Spirits - Sprinting Wolf video game. This game is available for the Game Boy Advance. Today's Shaman King Card of the Day is Wrath of Prisoner. Scott Gerhardt, andysislands and Dan the Timid have reviews. Friday, March 09, 2005 Today's Shaman King Card of the Day is Spirit of Fire Immortal Legacy. Darth Vailo, andysislands and Dan the Timid have reviews. Wednesday, March 09, 2005 Today's Shaman King Card of the Day is Marco Commander. Darth Vailo, andysislands and Dan the Timid have reviews. Tuesday, March 08, 2005 Our old friend Scott Gerhardt has recently gotten into playing Shaman King, and has his thoughts for you in an article titled: "Welcome to Shaman King". This article is intended to give readers answers to questions from a number of perspectives. Monday, March 07, 2005 DanTheTimid wrote a Strategy Article fo you guys today regarding The 3 Phases of a Duel. Check out our Tips section today. Today's Shaman King Card of the Day is Rio - Dead Ender. Darth Vailo, andysislands, Dan the Timid have reviews and Scott Gerhardt joins us today. Friday, March 04, 2005 Today's Shaman King Card of the Day is Imposing Grandeur. Darth Vailo, andysislands, Dan the Timid and Knives 101 all have reviews. There's a bit of Shaman King game and video news on our regular Pojo's Friday News board today. We have articles discussing the games Shaman King: Power of Spirit and Legacy of the Spirits Sprinting Wolf and the new DVD that is now out. Thursday, March 03, 2005 Today's Shaman King Card of the Day is Triumph of Will. Darth Vailo, andysislands, Dan the Timid and Knives 101 all have reviews. Wednesday, March 02, 2005 Today's Shaman King Card of the Day is Relax. Darth Vailo, andysislands, Dan the Timid and Knives 101 all have reviews. Tuesday, March 1, 2005 Just some quick info for those of you looking for Card of the Day Reviews. We will still have 3 this week, and they'll be posted Wednesday, Thursday & Friday. "We will be having one [a tournament] at MegaCon this weekend and we will advertising and pushing the product at GAMA in March. Hopefully we will get more store owners familiar with our new game. Thanks, UDE"
Thank you Siren for being so pro-active and keeping all pojo-ers up to speed. Today's Shaman King Card of the Day is Dragon Aura. Darth Vailo, andysislands, Dan the Timid all have reviews and Knives 101 joins the shaman team. Wednesday, February 23, 2005 Today's Shaman King Card of the Day is Point Blank. Darth Vailo, andysislands, Dan the Timid all have reviews and Knives 101 joins the shaman team. Monday, February 21, 2005 We have our very first Shaman King Card of the Day today. We are looking at cards from the Reincarnation Starter Deck this week. Guardian X, Darth Vailo, andysislands and Dan the Timid have reviews today. AndysIslands sent us some Suggested Sealed Deck Playing ideas that he received from the folks at Upper Deck. We put that in our Tips Section today. Friday, February 18, 2005 Guardian Saint sent us 3 Deck Ideas for Shaman King decks. These are in our Tips Section today. Thursday, February 17, 2005 A day that will live in infamy. Okay ... probably not. But it's still an exciting day for fans and our staff. Today, we are going live with our new Shaman King site. Why Shaman King? Well ... the product has a lot of things going for it. It have a very cool anime & manga that we highly recommend. Its has some pretty cool video games. And a new Trading Card Game from Upper Deck has hit the streets. The TCG is fun & different. The new 2-Player Starter Set for the TCG comes two random 30 card playing decks, rule book, playmats and a DVD with two full episodes of the Shaman King Anime. Pretty Nice. First, a glimpse and thoughts on the Trading Card Game. In the TCG you have no hand! It's almost like playing a War with strategy. Your opponent fires an attack at you. You try to block and fire an attack back at him. Every card you pick up must be played. You pick up a card, and find a place to play it on your side of the playmat. This game introduces a unique twist that Upper Deck has been hiding for a while that, Chamber Cards. Chamber cards are cards that actually slide open with signature moves inside. Cards can have similar looking outsides, but the attacks inside are not known by your opponent the inside varies. I'm not going to get into how to play. Upper Deck has created a pretty cool playable demo on their site right here. Here is a "Reincarnation" Spoiler you can download. Give us a few days to get things in order. Links will be broken for a few days, as it will take us a few days to get things up. Feel free to send us Bios, Episode Summaries, Tips, Deck Ideas and whatnot right here. Thanks!